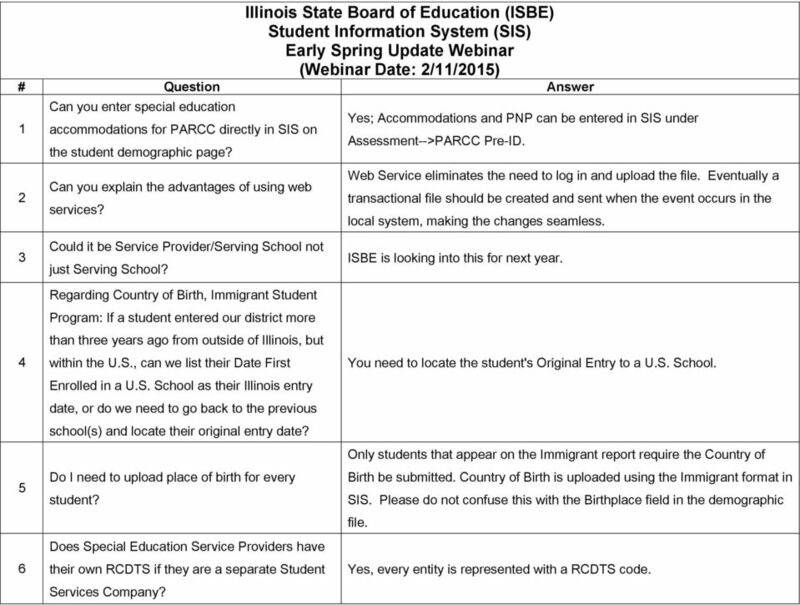 Download "Illinois State Board of Education (ISBE) Student Information System (SIS) Early Spring Update Webinar (Webinar Date: 2/11/2015) # Question Answer"
1 Illinois State Board of Education (ISBE) Student Information System (SIS) Early Spring Update Webinar (Webinar Date: 2/11/2015) # Question Answer 1 2 Can you enter special education accommodations for PARCC directly in SIS on the student demographic page? Can you explain the advantages of using web services? Yes; Accommodations and PNP can be entered in SIS under Assessment-->PARCC Pre-ID. Web Service eliminates the need to log in and upload the file. Eventually a transactional file should be created and sent when the event occurs in the local system, making the changes seamless Could it be Service Provider/Serving School not just Serving School? Regarding Country of Birth, Immigrant Student Program: If a student entered our district more than three years ago from outside of Illinois, but within the U.S., can we list their Date First Enrolled in a U.S. School as their Illinois entry date, or do we need to go back to the previous school(s) and locate their original entry date? Do I need to upload place of birth for every student? Does Special Education Service Providers have their own RCDTS if they are a separate Student Services Company? ISBE is looking into this for next year. You need to locate the student's Original Entry to a U.S. School. Only students that appear on the Immigrant report require the Country of Birth be submitted. Country of Birth is uploaded using the Immigrant format in SIS. Please do not confuse this with the Birthplace field in the demographic file. Yes, every entity is represented with a RCDTS code. 2 7 I don't know what a local SIS is... Local Student Information System (Local SIS) For Immigrant Education report, how do we know the date of the first enrollment in a U.S. school? For PARCC, talk about assessment session locations. I understand that we can only upload them once. Is that an ISBE limitation, or a Pearson limitation? Is that per student or per district? For students that are at a different serving school but the teachers are employed by a special ed co-op, is the service provider the serving school or the co-op? This should be collected as part of registration and included in the student file. This is a limitation from Pearson. The Assessment Session Location is entered for each test record (Math and English). The Special Education cooperative is providing the services. 11 How do I verify PARCC Pre-ID? 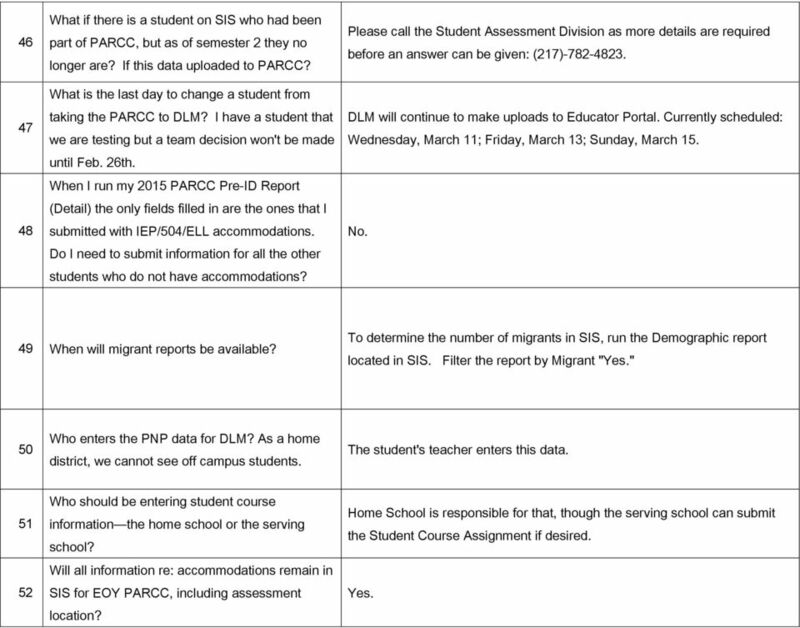 Run the PARCC Pre-ID reports in SIS. 12 How do we access the NGS? 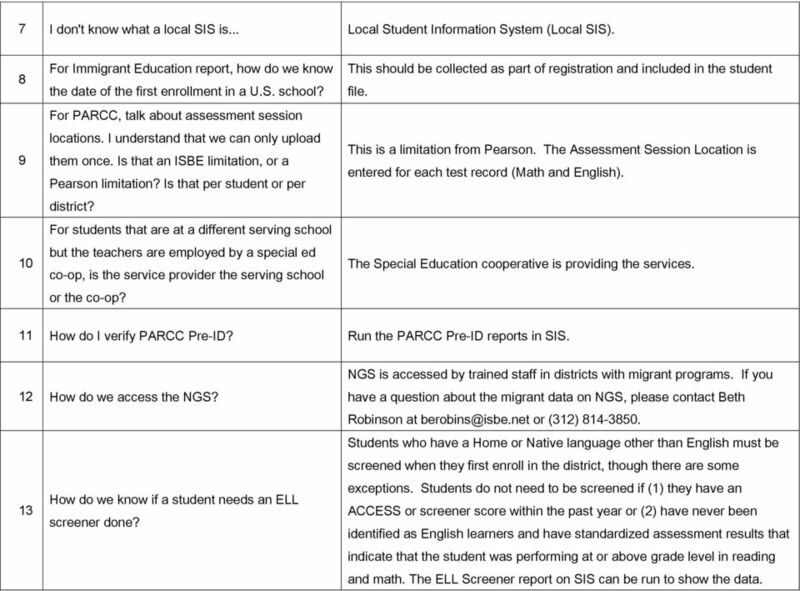 13 How do we know if a student needs an ELL screener done? NGS is accessed by trained staff in districts with migrant programs. If you have a question about the migrant data on NGS, please contact Beth Robinson at or (312) Students who have a Home or Native language other than English must be screened when they first enroll in the district, though there are some exceptions. Students do not need to be screened if (1) they have an ACCESS or screener score within the past year or (2) have never been identified as English learners and have standardized assessment results that indicate that the student was performing at or above grade level in reading and math. The ELL Screener report on SIS can be run to show the data. 3 14 15 How do we make PNP changes at this point for paper PBA? 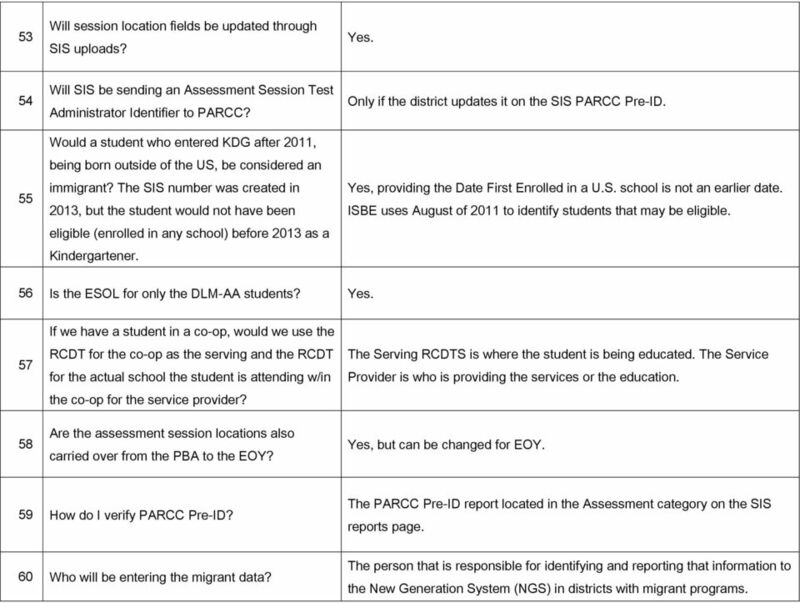 How do we update PARCC accommodations after the online PARCC window opens? Order paper materials via Pearson. Update the PNP in PearsonAccess and in SIS. Continue to update SIS until further direction is given from ISBE in future communications. 16 How do you submit PNPs? For PARCC, use the PARCC Pre-ID link in SIS. For DLM-AA, all PNP are entered through Educator Portal How should we handle students that transfer in during testing? Will you still be sending files to Pearson? I have multiple Illinois students residing in Ohio. Did you say that only the home school can upload data into the system? If so, do I contact each school district regarding course transcripts? I know that you discussed that in the future it may be possible for private facilities to update information in SIS, however we currently can t make changes. We have made several attempts with multiple school districts (we serve over 92) to have them update information in SIS so that DLM-AA can be completed. What happens if the home school district does not have the serving school information correct by the time the test window opens? I 'm from an RSSP. I've been instructed not to code the classes to SIS so I send all courses and codes to the home district, however, only one ISBE is still in development of the process; more information will be provided in future webinars and communications. Yes. The data will not be correct. Please contact the Help Desk (Option 2) and we can look at your scenario individually. Please communicate with the Home district to determine who will enter the data. 4 district has posted the info to the SIS. This makes numerous students without courses or teachers without students. Phone calls and s go unanswered. Any ideas for help? Also, many of the students have incorrect start/stop dates. Any chance serving schools will be able to change start/stop dates in the future? Since we know when the students actually enroll and exit, it would help immensely. If a student is at an out-of-state residential placement, with an RCDTS code, is that entity responsible for reporting to ISBE just as in-state serving schools are? 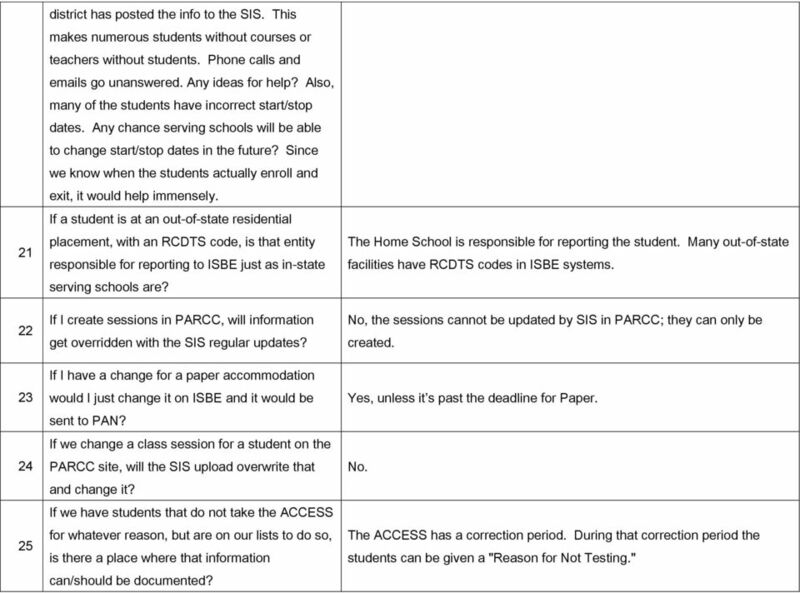 If I create sessions in PARCC, will information get overridden with the SIS regular updates? If I have a change for a paper accommodation would I just change it on ISBE and it would be sent to PAN? If we change a class session for a student on the PARCC site, will the SIS upload overwrite that and change it? If we have students that do not take the ACCESS for whatever reason, but are on our lists to do so, is there a place where that information can/should be documented? The Home School is responsible for reporting the student. Many out-of-state facilities have RCDTS codes in ISBE systems. 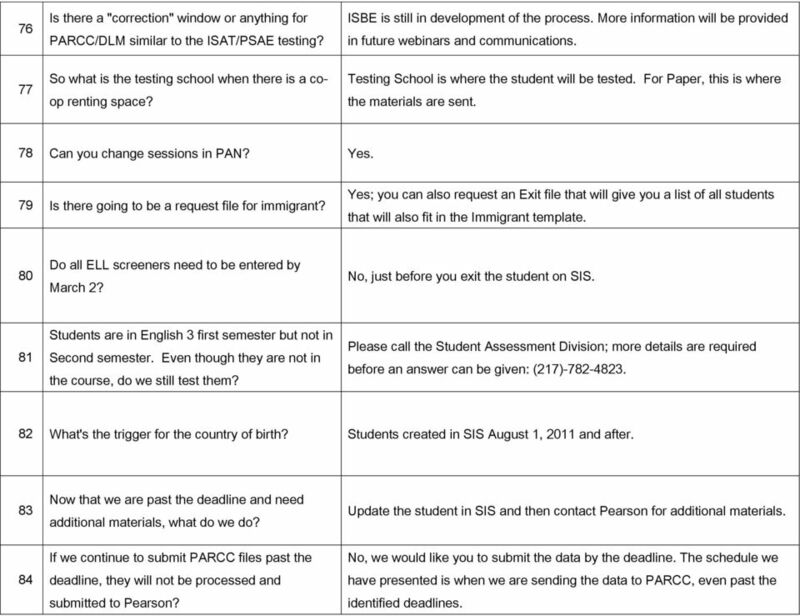 No, the sessions cannot be updated by SIS in PARCC; they can only be created. Yes, unless it s past the deadline for Paper. No. The ACCESS has a correction period. During that correction period the students can be given a "Reason for Not Testing." 5 if we ordered computer for everyone, is it too late to do paper for ELL and IEP students Is it still true that once we send out session location that we may no longer update it through SIS, but will have to make any updates through Pearson? Is the home school required to order the Paper Pencil test and provide it for the serving school? Is the PNP taken care of when accommodations are put into SIS Assessments? Is there a way to see the current materials that have been "ordered" in PearsonAccessNext? It seems that additional orders cannot be placed if you do not know what was ordered in the first place. Is there going to be an "Assessment Correction" period for PARCC? For instance, if a student is not tested, will we be entering a reason for not testing? Just to confirm: currently the date that is used as the determining date to be considered Eligible for Immigrant Education funding if born outside the U.S. is 08/01/2011? Yes. Correct. Initially, the home school should enter the data into SIS for upload to Pearson. However, the testing school can order materials during the additional orders window. For PARCC using the PARCC Pre-ID link in SIS. For DLM-AA, all PNP are entered through Educator Portal. Initial Order posted to PAN. ISBE is still in development of the process; more information will be provided in future webinars and communications. Yes. 6 33 Just want to confirm that everyone is taking PBA and EOY. I have Administrators that think it is one or the other. How do I know for certain? Correct; everyone should take both Last year for ISAT, there was a list of codes for students not tested; I know there is no "opt out" for PARCC, but is there a list of codes for reasons that students did not test? My accommodations have been entered into the SIS area for several weeks now. I noticed yesterday my accommodations are not in PAN. Is that normal? I thought this data would have exported to them by now? On the ISBE/SIS Key Dates it shows that the deadline to report DLM-AA Pre-ID is 3/6/2015. On one of the screens that Howard just showed us it shows this deadline as 3/2/2015. Which date is accurate? Our IEP and 504 students were entered through SIS as taking PARCC on paper, but Pre-ID report shows these students ELA online and we need paper. How should we handle this? Our updates in SIS are not transferring over to DLM/Kite. Any solutions? ISBE is still in development of the process, more information will be provided in future webinars and communications. Please contact the ISBE Help Desk at , option 2. DLM will continue to make uploads to Educator Portal. Currently scheduled: Wednesday, March 11; Friday, March 13; Sunday, March 15. Update the student in SIS and then contact Pearson for additional materials. Please call the ISBE Help Desk at ; option Please repeat the date when Country of Birth is March 2, 2015. 7 required. 40 Who can be considered a "new arrival" on the ELL export? New Arrival to U.S. is an ELL student who has attended schools in the United States for 12 months or less. 41 The assessment session location can only be submitted once. If we change the session in PearsonAccessNext, will the next SIS upload overwrite our change? No We are a co-op district with serving only schools. Some of our students who should be taking the PARCC test show up in the DLM and vice versa. How is this determined and how can it be changed? We have 5 ELL students. They just took the access test; do they need to take the PARCC test too? This is my first year involved in ELL. We have found that students are missing in PARCC but are in SIS. In SIS online, search the student under the test (PARCC or DLM-AA) they are under currently. Once the student is found select the button to move the student: "Move to PARCC" or "Move to DLM-AA. Yes, the students will test with both. Please contact the ISBE Help Desk at ; option What does PNP stand for? PNP stands for Personal Needs Profile. 8 What if there is a student on SIS who had been part of PARCC, but as of semester 2 they no longer are? If this data uploaded to PARCC? What is the last day to change a student from taking the PARCC to DLM? I have a student that we are testing but a team decision won't be made until Feb. 26th. When I run my 2015 PARCC Pre-ID Report (Detail) the only fields filled in are the ones that I submitted with IEP/504/ELL accommodations. Do I need to submit information for all the other students who do not have accommodations? Please call the Student Assessment Division as more details are required before an answer can be given: (217) DLM will continue to make uploads to Educator Portal. Currently scheduled: Wednesday, March 11; Friday, March 13; Sunday, March 15. No. 49 When will migrant reports be available? To determine the number of migrants in SIS, run the Demographic report located in SIS. Filter the report by Migrant "Yes." 50 Who enters the PNP data for DLM? As a home district, we cannot see off campus students. The student's teacher enters this data Who should be entering student course information the home school or the serving school? Will all information re: accommodations remain in SIS for EOY PARCC, including assessment location? Home School is responsible for that, though the serving school can submit the Student Course Assignment if desired. Yes. 9 53 Will session location fields be updated through SIS uploads? Yes Will SIS be sending an Assessment Session Test Administrator Identifier to PARCC? Would a student who entered KDG after 2011, being born outside of the US, be considered an immigrant? The SIS number was created in 2013, but the student would not have been eligible (enrolled in any school) before 2013 as a Kindergartener. Only if the district updates it on the SIS PARCC Pre-ID. Yes, providing the Date First Enrolled in a U.S. school is not an earlier date. ISBE uses August of 2011 to identify students that may be eligible. 56 Is the ESOL for only the DLM-AA students? Yes If we have a student in a co-op, would we use the RCDT for the co-op as the serving and the RCDT for the actual school the student is attending w/in the co-op for the service provider? Are the assessment session locations also carried over from the PBA to the EOY? The Serving RCDTS is where the student is being educated. The Service Provider is who is providing the services or the education. Yes, but can be changed for EOY. 59 How do I verify PARCC Pre-ID? The PARCC Pre-ID report located in the Assessment category on the SIS reports page. 60 Who will be entering the migrant data? The person that is responsible for identifying and reporting that information to the New Generation System (NGS) in districts with migrant programs. 10 Can accessibility features be turned on the day of the online testing? Is there going to be a way we can manually put in HS students if we don't have their course data uploaded? I am waiting for about 8 students to be released from prior districts still. What's the current status on being able to complete a batch upload for general education students to the Pearson site in order to create sessions? Specifically, who's in control of pairing students with test administrators? For the session location import, can a student be listed in say, 3 ELA sessions with different session names? Our middle schools have rather complicated testing groups. If a student is sent to another school for services and the host school contracts out the service to a private entity, whose RCDTS populates the service provider field? I have students that appear in the CC grant but not in CC funding, why is that so? Yes, by utilizing the PNP role. No, Student Course data is required. The schools and districts control this process either initially via the SIS Pre- ID upload, batch upload using the Sensitive Data Role, or online in PAN using Manage Test Sessions. A student should be in one math and one ELA session. Whatever entity is providing the services to the student. egms Grant report just shows whether your ELL student data that determines TBE/TPI and LIPLEPS funding is complete or not. The egms Funding report shows the students that generate TBE/TPI and LIPLEPS funding. 67 Please clarify the distinction between accommodations and the PNP file. They are the same in SIS, PARCC Pre-ID. 11 68 Can we change the assessment location for EOY? Yes; update the Assessment Session Location before we send EOY. 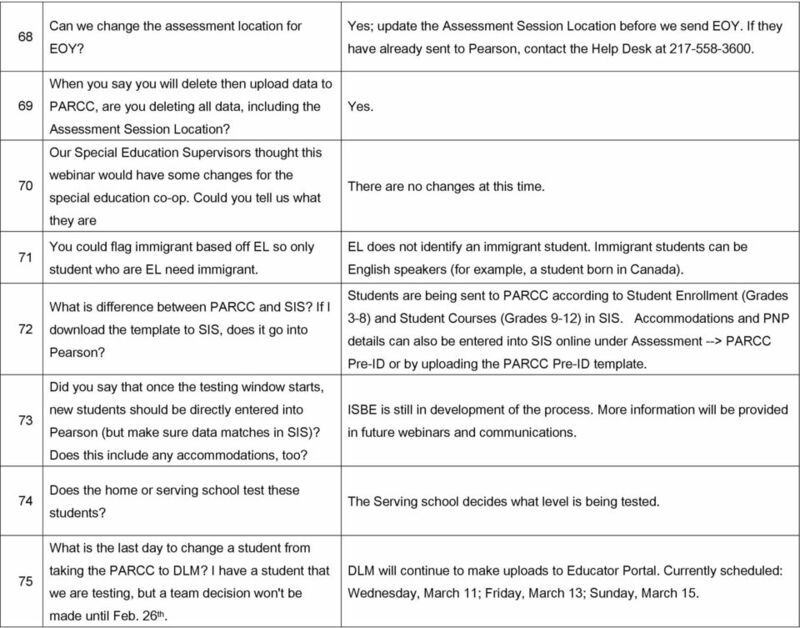 If they have already sent to Pearson, contact the Help Desk at When you say you will delete then upload data to PARCC, are you deleting all data, including the Assessment Session Location? Our Special Education Supervisors thought this webinar would have some changes for the special education co-op. Could you tell us what they are You could flag immigrant based off EL so only student who are EL need immigrant. 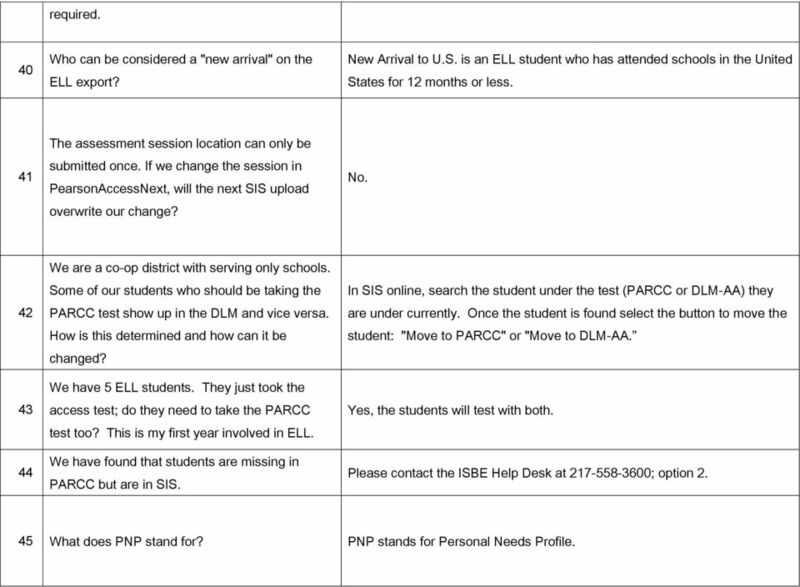 What is difference between PARCC and SIS? If I download the template to SIS, does it go into Pearson? Did you say that once the testing window starts, new students should be directly entered into Pearson (but make sure data matches in SIS)? Does this include any accommodations, too? Does the home or serving school test these students? Yes. There are no changes at this time. EL does not identify an immigrant student. Immigrant students can be English speakers (for example, a student born in Canada). Students are being sent to PARCC according to Student Enrollment (Grades 3-8) and Student Courses (Grades 9-12) in SIS. Accommodations and PNP details can also be entered into SIS online under Assessment --> PARCC Pre-ID or by uploading the PARCC Pre-ID template. ISBE is still in development of the process. More information will be provided in future webinars and communications. The Serving school decides what level is being tested. 75 What is the last day to change a student from taking the PARCC to DLM? I have a student that we are testing, but a team decision won't be made until Feb. 26 th. DLM will continue to make uploads to Educator Portal. Currently scheduled: Wednesday, March 11; Friday, March 13; Sunday, March 15. 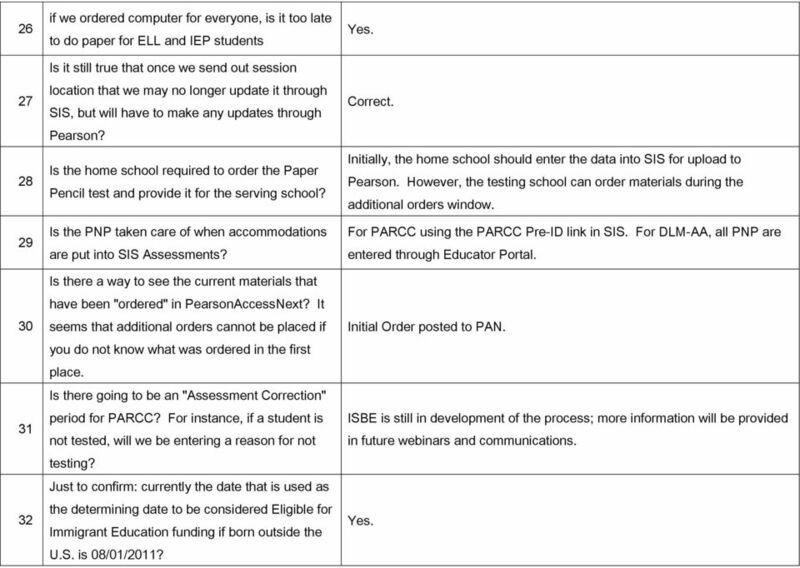 12 76 Is there a "correction" window or anything for PARCC/DLM similar to the ISAT/PSAE testing? ISBE is still in development of the process. More information will be provided in future webinars and communications. 77 So what is the testing school when there is a coop renting space? Testing School is where the student will be tested. For Paper, this is where the materials are sent. 78 Can you change sessions in PAN? Yes. 79 Is there going to be a request file for immigrant? Yes; you can also request an Exit file that will give you a list of all students that will also fit in the Immigrant template. 80 Do all ELL screeners need to be entered by March 2? No, just before you exit the student on SIS. 81 Students are in English 3 first semester but not in Second semester. Even though they are not in the course, do we still test them? Please call the Student Assessment Division; more details are required before an answer can be given: (217) What's the trigger for the country of birth? Students created in SIS August 1, 2011 and after Now that we are past the deadline and need additional materials, what do we do? 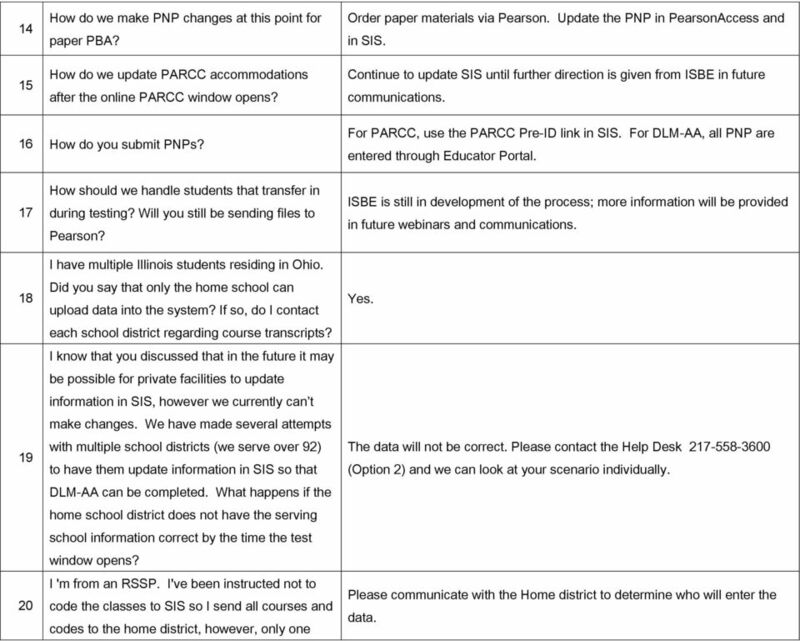 If we continue to submit PARCC files past the deadline, they will not be processed and submitted to Pearson? Update the student in SIS and then contact Pearson for additional materials. No, we would like you to submit the data by the deadline. The schedule we have presented is when we are sending the data to PARCC, even past the identified deadlines. 13 85 The nightly upload is not happening at this point with Pearson? No. 86 If we submit the PARCC Pre-ID and it doesn't have kids that were there before, are we just adding kids? We are adding and deleting the records from PARCC if they exit. When they enroll at the new school, they will appear on that school s PARCC. 87 Would we get Information from PNP? Yes; it rolls over from district to district. If you request a file, it will contain the information. If you upload a new file, it will over-write the data. 88 We are assessing sophomore level. Can we still do the DLM-AA students at grade 11? Yes. 89 Any plans for a file that we can download that will have the PARCC Pre-ID data? 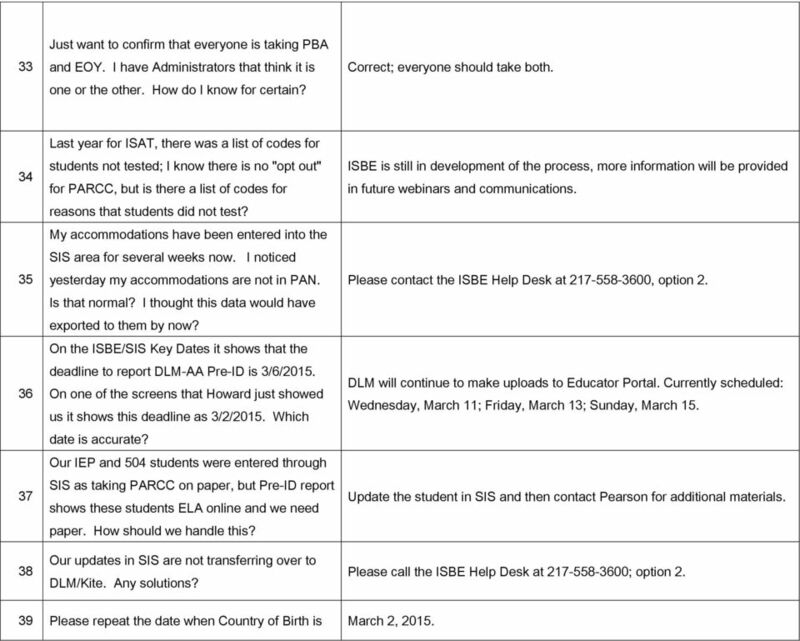 Yes; request a PARCC Pre-ID file from SIS. 90 Is PARCC testing according to serving school? Yes How do we identify what accommodations they need if we don't even know what course is being tested because we are the Home school? What if the student started the test at another district and moved to us? What if we are testing different classes or levels? If we have students come in at the last minute can we add them manually to PearsonAccessNext? If I do will it duplicate Work with the Serving School. The student does not have to test in your district. The option is up to the district. You can add them manually; it should not duplicate them. 14 them? 94 We are not receiving updates from our serving schools. What do we do? Keep working with the serving school We are having problems with the Public Districts enrolling the students in the correct serving school. How do we improve that? What happens on the start of the DLM-AA test if the students are not coded correctly? Is that the serving school s responsibility or the Home School? Keep working with the serving school. Please call the Student Assessment Division; more details are required before an answer can be given: (217) Is the same Pre-ID file used for PBA and EOY? Yes, it s the same file. ISBE creates two separate files to send to the vendor. 98 Do they have to take the PARCC if they are only taking one semester of a yearlong course? Please call the Student Assessment Division; more details are required before an answer can be given: (217) I put my accommodations in Online in SIS. If I submit a file from my vendor it will overwrite SIS. Yes, don't submit your locally-created Pre-ID. ISBE will transfer what was entered online to Pearson. 100 Assessment Session Location: what's the format? Alphanumeric, 45 characters, and no spaces. 101 Some students were not getting loaded into DLM. Has this been fixed. Most issues were addressed. However, if you find some that are not transferring over, let us know. We had a wonderful turnout for our second Iowa TIER Support Webinar. Many thanks to all who attended! Apologies for the limited webinar connection. We hope to have this corrected for the next webinar session. 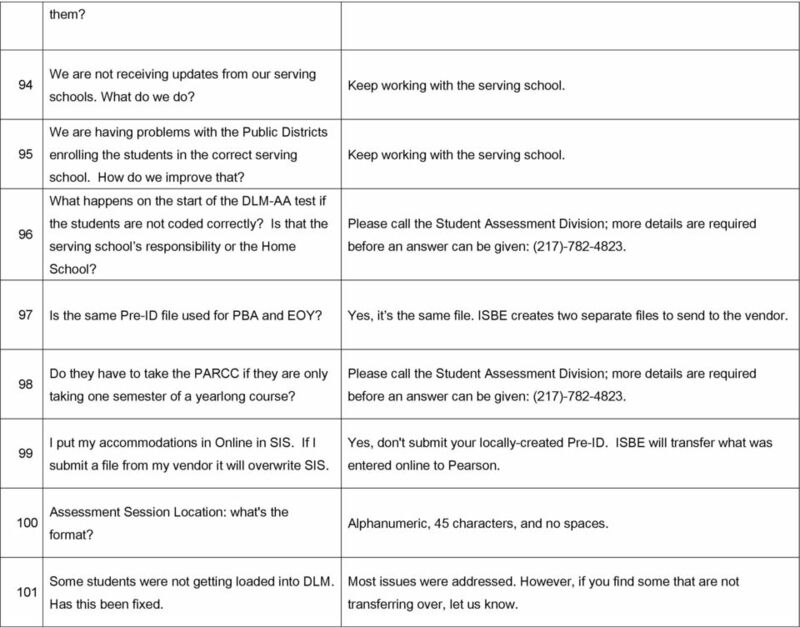 User Questions and Answers from the 9/12/2014 Iowa TIER Support Webinar. We had a wonderful turnout for our webinar. Many thanks to all who attended! Secure assessments include digital field tests for grades 3, 6, 9, and 12 and digital Provincial Achievement Tests for grades 6 and 9. Teacher Instructions Table of Contents: 2 Create Account 3 Redeem Content 4 Create Student Accounts Set Up Classes Assign Content 1. Create Account A. Master Codes provided by your Master Code Holder. 21 What is a threaded discussion on a Blackboard Discussion Board list? 22 Where do I access a Group Discussion on Blackboard? Instructional Management Program and Academic Communication Tool. QUICK GUIDE: SIM Summer For High School Programs. 06/01/2016 Version 1. Naviance edocs: New Users. 2012 Hobsons. All rights reserved worldwide. This guide will go through all steps of the process, and includes a Frequently Asked Questions section as well. 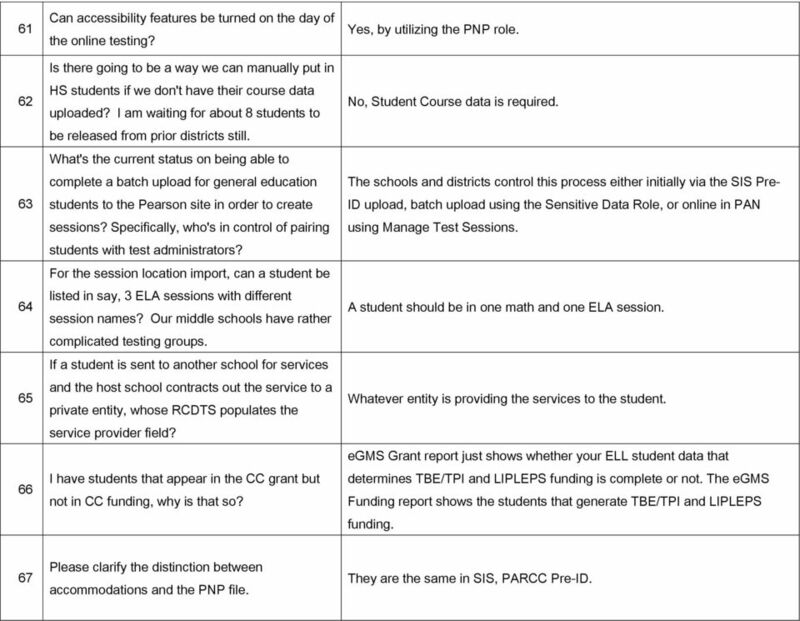 User Questions and Answers from the 9/19/2014 Iowa TIER Support Webinar. We had a wonderful turnout for our webinar. Many thanks to all who attended! PowerSchool Student Information System Document Properties Import and Export User Guide Copyright Owner 2003 Apple Computer, Inc. All rights reserved. This document is the property of Apple Computer, Inc.